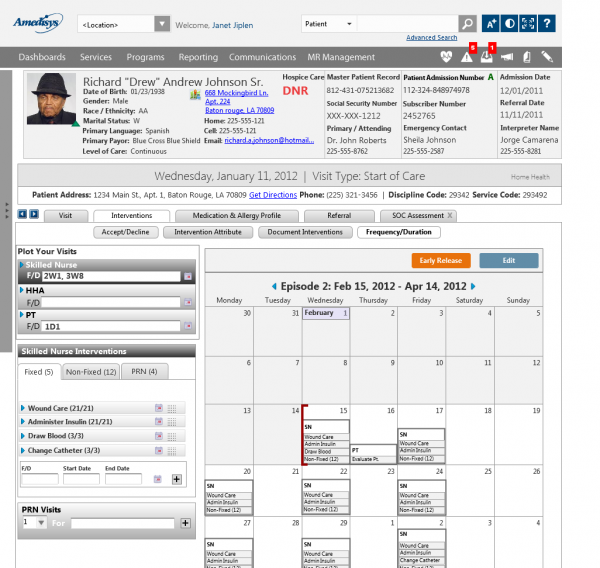 Amedisys Home Healthcare – the nation’s largest home healthcare network in the United States – had decided to completely redesign their existing Electronic Health Record System to meet new requirements mandated by the federal government and to address user pain points while increasing staff efficiency. A UX team of four was brought in to address interface challenges and understand user needs through user research. This effort resulted in a highly efficient interface allowing both mobile and desktop users greater speed in their workflow. As part of a small team, we each had to wear a number of different hats as well as work with a rather large team of developers, project managers, visual designers and business analysts. In addition, we had internal stakeholders from Amedisys we employed a participatory design methodology with. 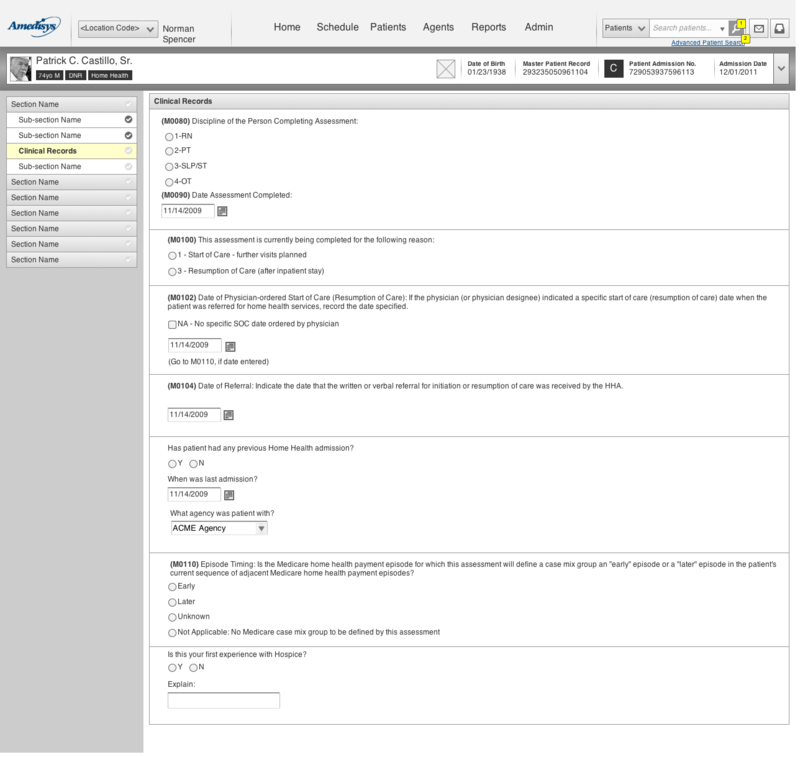 Weekly reviews were conducted and our team was on-site weekly to present new features and ensure requirements were met. User research involved observations, persona development and semi-structured interviews to validate written requirements. Wireframe development was non-stop and we used them as a discussion tool iterating early and quickly. This project was conducted on-site in Baton Rouge requiring extensive travel to our client’s home office as well as online collaboration when needed. Home healthcare is a complex industry requiring our team to spend significant time with stakeholders and nurses understanding how the current system did not meet their needs and what we could do to address those in our design efforts. There were a number of areas our team determined could use improvement. Scheduling was an arduous task for most nurses and doctors. It was not merely the interface that posed problems and proved time consuming. Medicare and Medicaid regulations often dictated the number of visits a healthcare professional could make within a given timeframe and this also related to compensation. However, the number of visits also needed to align with the medical literature in terms of giving the best care (i.e. how frequent and the frequency of visits to maximize efficacy of care). 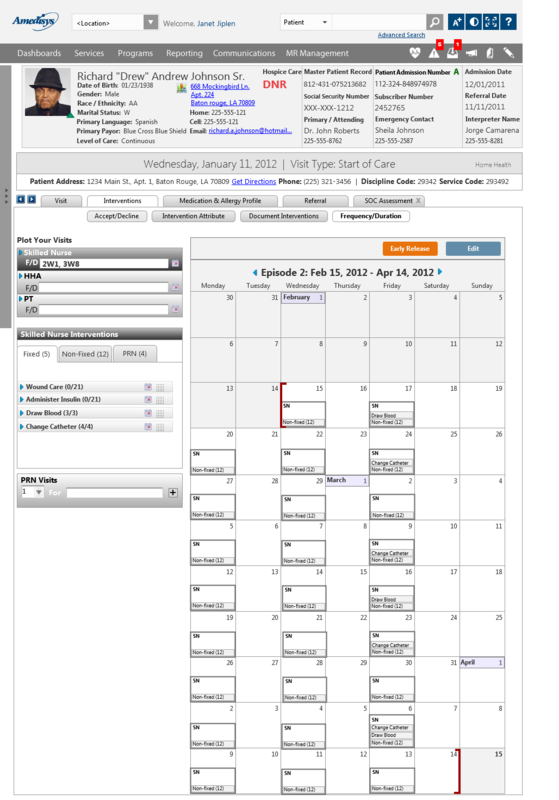 Nurses and doctors needed a quick method to plot visits that would compute the math for them. 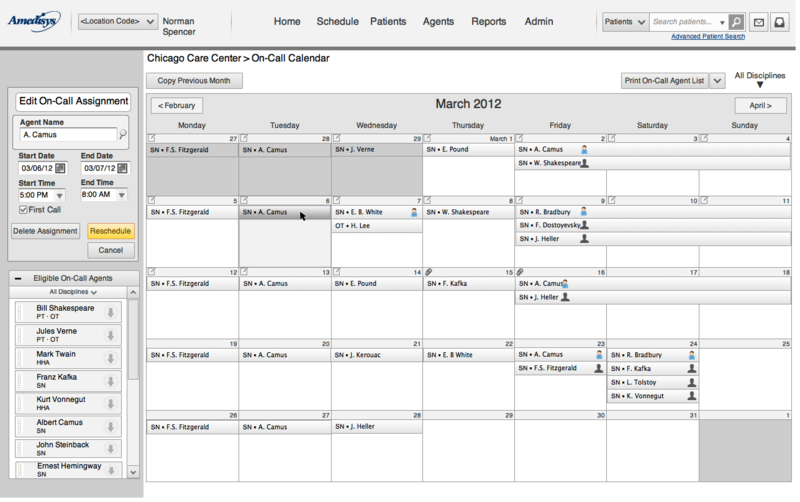 We built several complex scheduling systems employing logic so our users could plot visits over the approved and federally mandated 90 day care cycle. Scheduling on-call personnel and active professionals were also activities needing improvement to ensure local offices could maintain adequate coverage. This was not only an activity pertinent to patient safety and care, but also one that could provide bottom-line savings through ensuring the appropriate number of staff were scheduled, but the local office did not overschedule members. 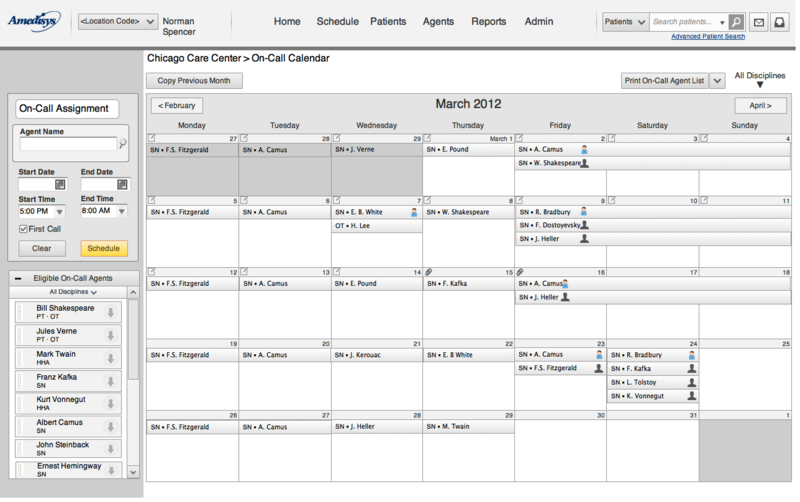 We built a number of wireframes and prototypes for scheduling staff availability with complex logic behind them and profile information allowing schedulers to quickly contact staff members when needed. Healthcare is rife with forms, paperwork and administrative tasks. We devoted a considerable amount of research to understand exactly what professionals needed and designed dozens of forms to comply with federal and local mandates accounting for print views and digital views of the information entered. 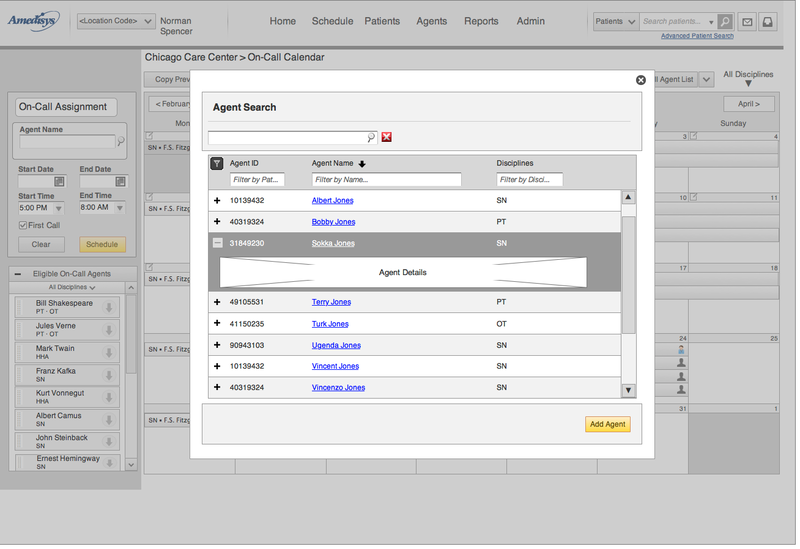 We also designed forms that were able to be quickly scanned and completed for healthcare professionals to maximize their time spent entering data. Axure was our sole tool used to engineer the complex interfaces. In some instances, prototypes were needed to convey functionality. Axure was used in those scenarios as well and we also exported documentation using Axure for XAML developers and our visual design staff. We also used personas to guide the design process and enable us to keep a clear picture of the user as we moved through the various features. Additionally, we developed an extensive pattern library for Axure to compliment our style guide ensuring consistency in our designs. 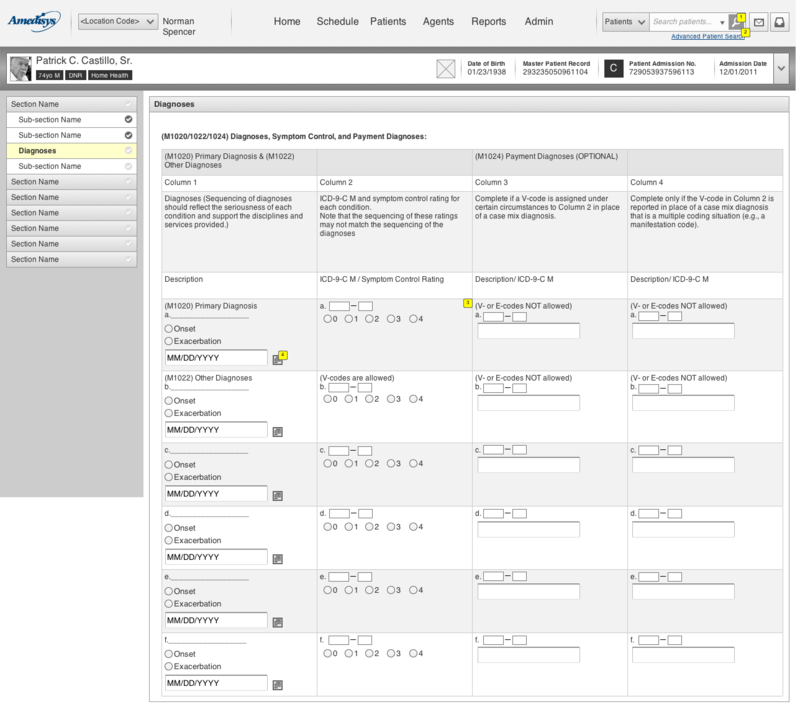 View a sample set of specifications for the Frequency-Based Scheduling feature I designed and shepherded through the design and development process.